Today’s ponderings are not sophisticated. But I am cooking an awful lot of one thing recently, so I thought I’d tell you about it. That thing is chips. Oven chips. Blake is deeply, irrevocably, madly in love with oven chips. As a baby, Blake was a cracking eater. His logic went – you cook it, blend it to a pulp and shovel it into my mouth and I’ll eat whatever you throw at me Momma. Now his logic goes: this does not look like chips. Therefore it is disgusting. It is a tiresome little game, because having eaten so well as a baby his palate is fairly good. If I can get it past his iron will and locked jaw, generally he will enjoy it. But rarely do I do so. Except now he is passionately in love with chips. 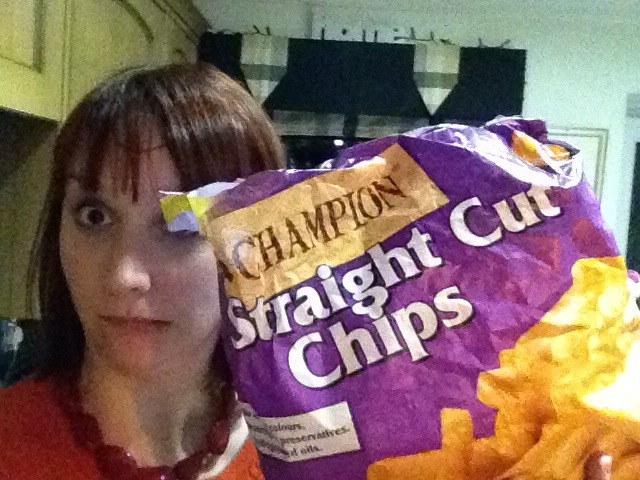 And chips, it seems, are the trump card of bribary. They have been gifted to me, in all their 80p Aldi glory, as the one thing my fussy, stubborn little boy cannot resist. So I am cooking a lot of chips. Blake will potter into the kitchen (often with no pants or trousers on, because that is what one does once one is potty trained apparently), sit down on his little white chair and watch me load them into the oven with glee. And then he will sit patiently, for 15 minutes, waiting for them to be cooked. And he will munch absent-mindedly on some cucumber *VEGETABLE CONSUMPTION AIR PUNCH* while he waits. And whilst that is going on, I will quietly prepare a previously rejected food like omelette or cherry tomatoes in the corner. Here is the killer move. I will present said food to him 1 minute before the chips are ready. And he will shove the plate away and shout and pout in his usual style. And then the timer will go off and I will dish up those chips with a flourish and deliver the line ‘ok sweetheart, you have a choice. If you want the chips, you need to eat two pieces of the omelette/tomatoes for me first.’ Down it goes, like feeding sweets to a baby. And shock horror, he discovers he likes it! And in the time it takes for the chips to cool to an eatable temperature, the omelette or tomatoes or whatever has been eaten. Boom. The pre-child me would be rolling her eyes in disgust at me about now. Fancy bribing one’s child with oven chips! What a revolting mother! What I have come to realise you see, is that with children and eating, you are in it for the long-term and the end game. What you need is a strategy. And if a brief period of chips is what’s needed to crack my child’s current faddy approach to food and set him up long-term to eat a varied and healthy diet, then chips it shall be.